fire doors is now required! Free with maintenance service contract - click here for details. The Chute Doctor services and repairs more chutes in the Western United States than anyone else. 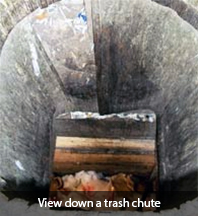 Let’s face it, trash chutes don’t get treated with a lot of care. People open the chute intake doors, stuff their stuff in, and hopefully shut the doors again. If using them is an unpleasant experience, if they smell, for instance, people tend to treat them worse. A common complaint about trash chutes is odor. But odor is only a symptom. It means that all sorts of nasties are living in your chute, smelling it up and potentially causing sick building syndrome. Chute intake and discharge doors that don’t function properly or close all the way are also a serious fire hazard. That is why regular cleaning and trash chute repair is so important. 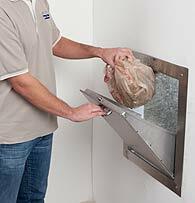 Find out about our trash chute cleaning, odor control and maintenance services and get a FREE instant online quote. With regular service, you won't have to worry about whether your trash chutes are in good repair and helping to keep your building safe and healthy. The Chute Doctor is the world's largest single source for trash, recycling, and laundry chute parts. We have replacement doors and other parts for virtually any chute! Guaranteed. We carry trash and laundry chute doors - intake doors, discharge doors, and access doors – trash chute parts, door handles and trim, odor control systems and supplies, as well as chute-fed compactors and compactor parts. Whether your chutes are manufactured by Western Chutes, Wilkinson Chutes, Midland Chutes, or any other manufacturer, The Doctor has the replacement parts you need. Click on Buy Parts to find the parts you need. Service customers and customers who have accounts with us save 10% or more on all parts. If you don't already have an account with The Chute Doctor, you can set one up now. The Chute Doctor is exclusively in the trash chute, recycling chute, and laundry chute business … and the compactors they feed. We have been for over 35 years. The Doctor has the right prescription for your trash and laundry chutes to keep them healthy, odor free, and in good repair. We are licensed in California and Arizona, and carry worker's comp and liability insurance.